Welcome to our family room. You haven't been here in awhile so come on in! This is where we sit with friends. We eat supper on the couch. We watch all our favorite shows. I tried to get Belle to smile for you but she's snoozing. See my cute new pillows? Actually the couch is new and I forgot to show it to you. We gave our other couch to our son back in March. The awesome patterned pillows were a gift from Wendy at Life on the Shady Grove. The love of my life wanted leather recliners so we got those too. I have to be honest and say I thought I'd croak buying recliners but they are a dream to sit in! Sometimes I look at them and think they are u.g.l.y. but he lets me do whatever I want decoratively so if he wants recliners that's a small thing. I'm having so much fun bringing in zinnias for jars and vases this summer. To me they are little jars of happy. This is where we'll sit when I host book club next week. Oh speaking of that, I have a book give away to share with you in a day or two. Pretty pillows! I love zinnias…one of my favorite summer flowers. Love your family room! Love the summer colors added to your room, those pillows are so beautiful! 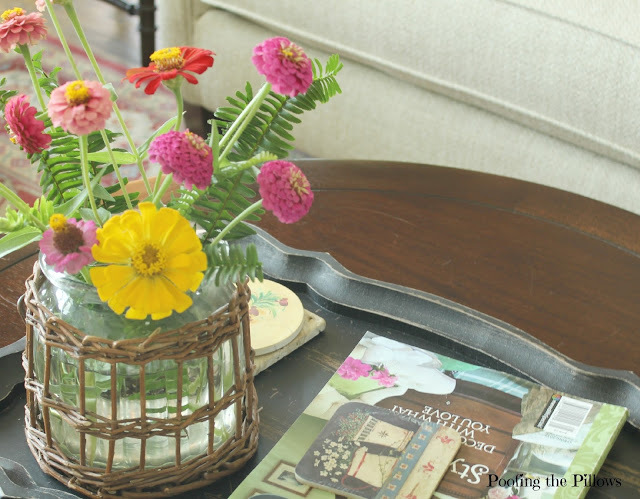 I love fresh flowers in the home too, zinnias are perfect for cutting from the garden! Have a lovely week. What a pretty, cozy room--just perfect for hosting book club! :-) Those cute pillows are such a nice pop of sunshine! What a darling little pound puppy and a beautiful room too. We adopted two rescues that are sisters earlier this year. We adore them. Your room is lovely. You are so funny about the recliners....I have been there and I know how you feel but isn't it funny how Ron always caught me in his chair?! The room looks so cozy and inviting, Stacey. And there is pie! Beautiful room. We purchased a similar sofa this Spring and were afraid to sit on it for the first day. Now we eat on ours too :) The pillows are beautiful, I don't know that blogger so I need to hop over and visit. Happy Wednesday to you too! Your family room looks beautiful, Stacey! Love your new pillows and let that puppy get it's beauty sleep. Hi Stacey thanks for stopping by...I love the sofa and those recliners are heaven, let us know where you bought them Stush would love one! What a neat blogger friend to gift you with the pillows, they go so well with your familyroom too! Belle looks mighty comfy in her chair!! I think I'd get lost in a deep snooze there. Stacey, your family room looks so cheerful and inviting. A place for perfect family time, TV time and relaxation. And do you know that we have a leather recliner like yours? Yup, only one. But it is the perfect napping chair AND it stays nice and cool. Your family room looks delightful. 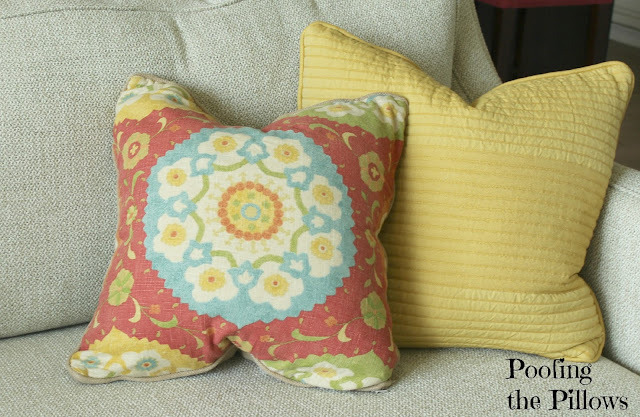 I love your colors, the fun new pillows, and of course Zinnias! Hi Stacey, love your family room and your new sofa is beautiful with the summery pillows. How sweet is your little puppy sleeping on that gorgeous chair. The recliners do look comfy and I love the color of the leather. Love the flowers. One of my favorites and so hardy. It looks like a warm and welcoming spot to hang out and be comfortable! Just like 'home' should be. Lovely! 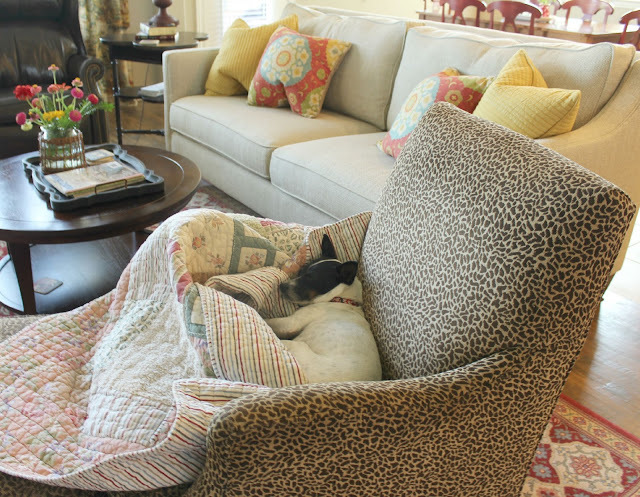 Love your living room and love your little furry napper too. I just re did my living room with all neutrals and slipcovered couch but still have the two leather recliners. Terry is so good about living in my white ruffle world that he still needs his man chair lol! I have to say recliners are not always pretty to look at but are comfy for sitting in. Everything looks wonderful. It all looks so pretty Stacey! You should post it on IG! Loving the new pillows! It all looks delightful! 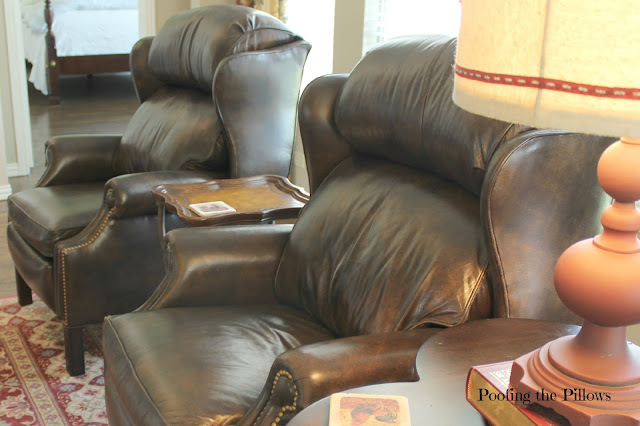 We love a good recliner and had some that felt like a big HUG when you sat down! However, they were ugly and worn out SO we bought a fancy new sofa that weighs about a ton and features 'recliner' like seats on either end. Wish we had bought two good recliners like yours instead! What a wonderful comfy and inviting place to enjoy! Love your family room...perfect space to host a book club. Pretty zinnias too! Post more pictures of Belle. I think she is Milo's long lost sister. That leopard char is bananas. Can't wait to see the entire reveal. Your puppy is so cute sleeping, love the pillows too! I think the room is perfect...especially the pup! ;) I have never been a fan of the look of leather recliners either, but you are right, they are amazingly comfortable. Yours look very pretty though and frankly when you're sitting in them, you can't see them, you can only feel them....ahhhh! Enjoy them! Love those pretty pillows Stacy! So funny, I just sent my husband on a pillow hunt the other day for our new couch in the family room. I wanted a different spin on what I typically pick out. He did a great job too lol! I love your home and family room. It is so cozy! Your family room is so pretty, you should share pics of it more often. :) Love your new couch and the pillows are the icing on the cake! I think I need to join Belle and take a nap right about now. I thought of you the other day when someone posted a pic of their kitchenaid mixer on Instagram. It used to be white and she used appliance paint to make it red. Weren't you the one who said you wish you would have gotten a red one? Anyway, I never would have thought to paint a mixer, but hers turned out great. Happy Friday! Those recliners look extremely comfortable and classy as well. Lovely room and pillows to grace the new couch. That is such a cozy, welcoming and pretty room, Stacey! I don't blame Belle for not waking up from her nap ;) I love the quilt she's sleeping on. Hi, I love your new sofa. I hope you don't mine telling me where you purchased it and what brand it is. I have been searching for a new sofa and haven't found the right one yet. That is one lucky pound puppy. I would love to be curled up in that char with such a charming quilt. I don't think I've seen your family room before and I like it! It is so nice to think of you having book club there (I wish I lived closer), watching TV and eating pie (like I said, I wish I lived closer!) You have a very pretty new couch and pillows and your recliners are just like the one we chose for hubby! I think that leather wingback recliners are a good choice. I hope your week is going well dear Stacey.